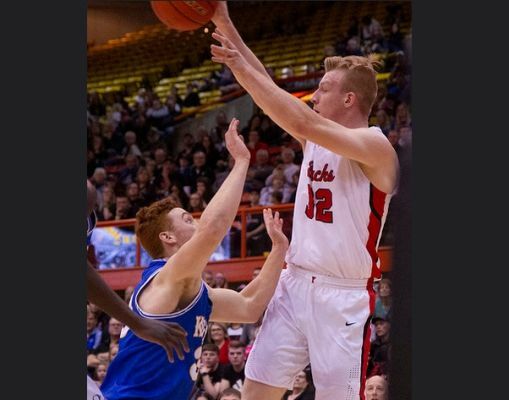 Matthew Mors (32), playing in this year's state tournament, leads the Class AA Boys Basketball All State Team. UNDATED - The South Dakota Basketball Coaches Association released it's season-ending Boys Class AA All State Team Wednesday. Leading the first team was Matthew Mors of Yankton, who helped lead the Bucks to the state tournament once again this year. Mors averaged 23 points per game during the year and is attracting a lot of attention from Division I schools. Joining Mors on the first team were Evan Talcott and Carter Olthoff, both seniors from state champion Brandon Valley, senior Jared Jaros of Sioux Falls Lincoln, senior Nick Hoyt of Harrisburg and junior Kobe Busch of Huron. Locally, Rapid City Stevens senior Dylan Pourier and Sturgis senior Ryan Garland made the second team.